This event is filled with concerts by legendary performers, storytelling, poetry, Buckaroo Roundup skill drill, Chuck Wagon Cook Off, dancing, dinner theater, workshops and clinics, and much more to get you in touch with your inner wrangler. Baxter Black – Hailed as an author, poet, veterinarian and entertainer, Baxter has made the publicity rounds to venues including National Public Radio, Johnny Carson&apos;s Tonight Show and USA Today. A real live cowboy, Baxter brings his special blend of entertainment and common sense to the annual Saddle Up! event and is someone audiences will sit and listen to for hours. Wylie And The Wild West - Described by some as "old-school cool," Wylie and the boys offer a balanced mix of classic country with a modern edge. You&apos;ll love the traditional country and bluegrass music that has delighted fans for years and helped them become one of the most popular acts on the festival circuit. Brenn Hill – An award-winning singer/songwriter, Brenn puts his life into every song he creates, whether it be trials or triumphs. A native of Utah, his career has left him in the prized position of being able to do what he loves every day. You&apos;ll also have the opportunity to take in performances by Chuck Pyle, Jean and Gary Prescott, Andy Nelson, Skip Gorman and T. Scot Wilburn. In between the entertainments, make sure you leave time to participate in some of the activities on hand. Buckaroo Roundup – Ever tried your hand at roping like a real cowboy? How about branding or riding? The Buckaroo Roundup gives you the perfect chance to beef up your skills with help from professionals. Head to Clabough&apos;s Campground for this free exhibition and hands-on workshop. 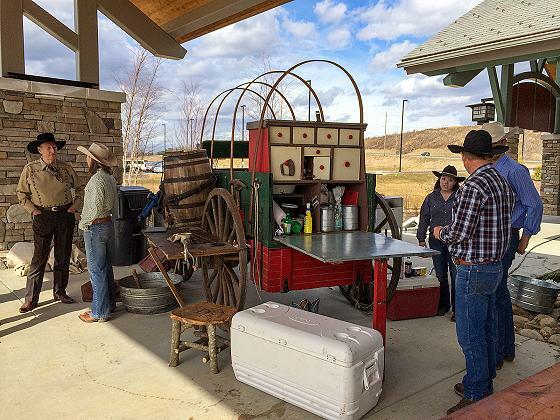 Then stick around for the Chuck Wagon Cook Off that starts at noon. Plates are $12.95 each with grub every cowboy would approve of. If you&apos;d rather have a sit-down meal, dinner concerts are scheduled featuring Kent Rollins, Jean Prescott and Gary Prescott at Mama&apos;s Farmhouse. The cost for each is $54.88 per person with limited seating, so get your tickets early. Swing Fiddle Classes – What&apos;s a cowboy without a fiddle? This free workshop (on 2/18) is designed to improve your talent regardless of what level you are currently at. Paul Anastasio will be on hand to teach you tunes and techniques. Cowbucks Café - Mark your calendar for February 19 because, according to the Saddle Up! website, "Your ticket gets you a seat at the Old Mill Pottery House Café, beverages and pastries, and two collectible items: our 2015 poster and a Saddle Up! mug, handmade by the talented artists at Pigeon River Pottery. Saddle Up! artists will be on hand for pictures and autographs, and to share a sweet breakfast provided by our friends at the Pottery House Café." Western Dance Classes - A free workshop will have your toes tappin&apos; and your boots stompin&apos; under the direction of The Nashville Network&apos;s Club Dance dancers. Not only is this a fun event for the entire family, it&apos;s also great exercise! For a cost of $21.95 per ticket, you&apos;ll fill your afternoon with laughter, tunes and memorable recollections of cowboy life from some who have lived it firsthand. Tales And Tips From A Cowboy Cook – What a treat! (Literally.) At the hands of a master, you&apos;ll discover tips and tricks for grilling steaks that are flavorful and tender. Your host and teacher is Kent Rollins, who has appeared on such prominent TV shows as Food Network&apos;s "Chopped: Grill Masters" and has been named one of the US&apos;s top 16 grillers. Cowboy Church – There&apos;s no better way to end your visit to the Smokies than with cowboy church. Starting at 10:30 a.m. on February 22, you&apos;ll have a chance to worship and give thanks before heading home. Need a place to stay? Log cabin rentals in Pigeon Forge are a great way to go. There&apos;s plenty of room for the entire family and often they are less expensive than hotels. Break out your boots and your Stetson and make plans now to head for the hills February 18–22, 2015, for the annual Saddle Up! festival. ng steaks that are flavorful and tender. Your host and teacher is Kent Rollins, who has appeared on such prominent TV shows as Food Network&apos;s "Chopped: Grill Masters" and has been named one of the US&apos;s top 16 grillers.